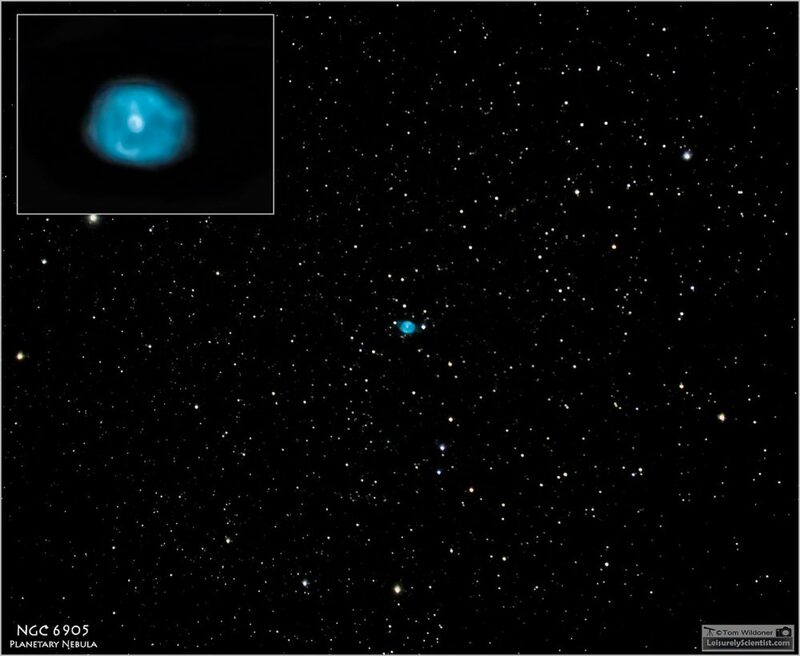 The Blue Flash Nebula, catalogued as NGC 6905 in the New General Catalogue, is a small but relatively bright planetary nebula located in the constellation Delphinus. The nebula has an apparent magnitude of 10.9 and lies at an approximate distance of 7,500 light years (2,300 parsecs) from Earth. The nebula’s exact distance is uncertain, but estimates put it in the range between 5,500 light years (1,700 parsecs) and 8,500 light years (2,600 parsecs). 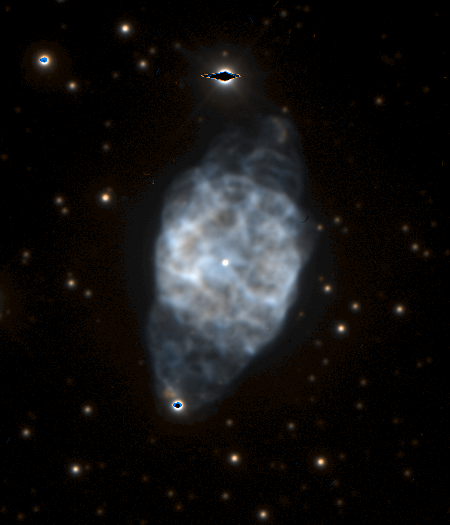 Like other planetary nebulae, the Blue Flash was created when an old, evolved star ejected its outer shell late in its life. After most of the star’s atmosphere was dissipated, the expanding shell of expelled gas began to be ionized by the ultraviolet radiation of the star’s hot luminous core. The absorbed light from the star causes the shell of gas to glow as a brightly coloured nebula. The central star of the Blue Flash Nebula, a white dwarf, has a visual magnitude of 14.0 and an estimated surface temperature of 150,000 K.
The Blue Flash Nebula occupies an area 1′.2 in size. The nebula’s structure consists of an internal shell with an angular size of 47” by 34” and extensions along the main axis that are conical in shape. NGC 6905 can be seen in 4-inch telescopes under extremely good viewing conditions, but is better observed in larger telescopes. The nebula lies close to the border between Delphinus and Vulpecula, near the tip of Sagitta constellation. It is situated in a dense field of stars and framed by a trapezoid of 11th magnitude and fainter stars. In 10-inch telescopes, the nebula appears bright, large and oblong in shape, with well-defined edges. The best time of year to observe it from northern latitudes is in the summer, when Delphinus is high overhead in the evening. The Blue Flash Nebula was discovered by William Herschel on September 16, 1784. The nickname Blue Flash is believed to have been first used by John Mallas, an amateur astronomer who wrote a series of articles about planetary nebulae in The Review of Popular Astronomy in the 1960s.